At one time it was thought that the AEC Routemaster would be the last specially designed and built bus for London. That was designed in the early 1950’s to a classic iconic design, known the world over. However, almost 60 years later a competition was arranged for a new design of a London bus and from the many entries a design was chosen. The Wright Group based in Ballymena, Northern Ireland were selected as the builder of these buses for Transport for London. 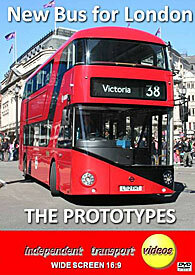 During late 2011 and early 2012 a total of 8 prototypes were delivered to London for trials and evaluation. They were all put to work on route 38 that runs between Victoria and Hackney Central and are operated by Arriva London from their Ash Grove garage. They are hybrid diesel-electric buses, and have Cummins ISB Euro 6 four cylinder engines with an electric drive from a Siemens motor. Numbered LT1 – LT8 the buses are owned by Transport for London. They do not have a ‘name’ as such, they are just known as the ‘New Bus for London’, or ‘Borismaster’ after the Mayor of London, Boris Johnston, the instigator of the project. This video programme features all of the eight prototypes in action in the capital. Our filming actually starts in Birmingham at the N.E.C. in November 2012! Here we take a detailed look at LT3 which was on display at the Euro Bus Expo 2012 exhibition. We then move back in time to October 2012 and film the buses in action on route 38 in London. We travel on board LT1 from Victoria to Hackney Central and then back to Piccadilly Circus on LT8, filming the route from both decks and observe other members of the fleet passing by. We conclude this visit with more footage shot at Hyde Park Corner and at Victoria. Our second visit to London is in April 2013 when we travel on LT6 the whole length of the route. With filming complete at Hackney Central we board LT2 and travel to Islington. We then join LT5 and ride as far as Piccadilly where more action is filmed at Piccadilly Circus and also Victoria. Our final section is filmed at the London Bus Museum Spring Gathering at Brooklands also in April where LT5 makes an appearance to give rides to enthusiasts and the general public. This certainly is an eye catching vehicle! It has captured the interest of the travelling public as well as bus enthusiasts young and old. A further 600 NBfL vehicles will join TfL during 2013/14, the first going into service on route 24 – look out, our cameras will be there! We would like to thank the drivers and staff for their help while making this video programme. Duration : 61 minutes (approx).